Curated steampunk goodies. Because you've probably seen it all before. One day recently I was Wikipedia trolling, and through a series of clicks that I’m not sure I can recount, I found this image entitled the “Fluidic Effect”. 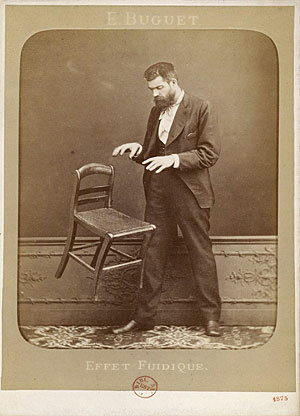 It was about some dude that claimed to be able to levitate different objects using his mind power–telekenesis, I guess. The picture immediately jumped out at me as having some serious steampunk qualities, and I’m not fully sure why, that’s just how it struck me. You be the judge: How bout it, right??? That’s all.